​A comprehensive Reading & Spelling Program for K-5, Homeschoolers, children with learning differences like dyslexia, and all levels of English language learners. The absolute best sight word cards on the market! "These cards are wonderful!! AS a dyslexia specialist, I needed another way to help students learn sight words. I have a student who had not been able to read or spell "were", despite months of practice. One session with the card, and he can read and spell the word by visualizing the picture. I have trieed other products, but my students prefer these, because they are not too busy with extra details. Must have for anyone, whether home school parent, teacher, or tutor!" "These are beautiful and well designed cards! It is amazing how quickly my 4 year old recognized the words and the sentences that go with each card. In 2 lessons she knows 10 words, how awesome that learning can be this painless." "This is an fun and exciting way to introduce sight words to students. My students have fun drawing the picture clues and are learning at the same time!" "I LOVE these word cards! They make sight words a breeze for kids to learn. No more tantrums and tears, just fun pictures that make learning easy." "I really saw vast improvements with my dyslexic kids. This visuals where very supportive and help them recall high frequency words that were harder to decode!!" "Fantastic tool! These cards provide a memorable visual cue to help struggling spellers/readers remember how to spell common homophones. Both the visual and the sentence on the back of the card helps trigger the correct spelling. As a reading specialist, I am grateful to have these visual flashcards to help my students! I use their other two sets of sight word flashcards too. Powerful tool, highly recommended!" 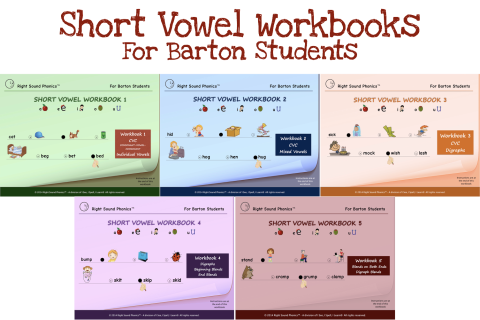 Love these short vowel story books! 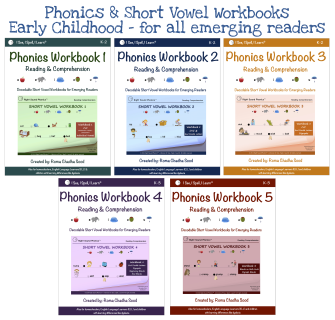 "Finally, books for beginning readers that stick to short vowels!! Because the words have short vowels only (with a few sightwords), beginning readers can be successful! As a Barton Reading Tutor, these books are perfect for my students who have just completed Level 2 of the program. The pictures are cute and entice reluctant readers to apply their new reading skills. So happy to have appropriate books (short vowels only) for my students to practice, practice, practice!!" "Repetition, simple patterns, and organized lay out! Love these little readers!" ​"This was a good purchase. 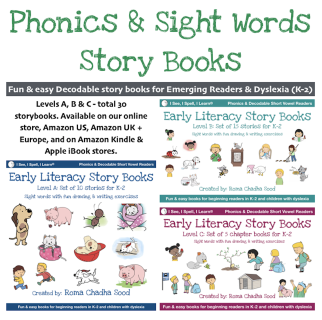 I was needing more lower level books to help my students with sight words." "I really like this series. I am a Kindergarten teacher and am always on the lookout for books which are truly decodable and have an interesting story. These books will help children build confidence in reading ability and comprehension." "We were thrilled to find these readers. Our daughter is learning to decode short vowel words and she needs practice. Most early readers use a lot of words that employ spelling rules that are overwhelming and confusing to our daughter. These books are truly phonics based and decodable. The stories are "real" stories that children like, and the illustrations are beautiful. Our daughter wants to sit and read through them over and over. I really appreciate the option of purchasing a whole set of readers at a true discount. Thank you, Ms. Sood, for a wonderful learning tool!" "My niece has such a hard time reading, school in general but she was disappointed when she saw i got her books to help her with her reading. But when she started reading them she as ecstatic! She was reading and not having any problems. 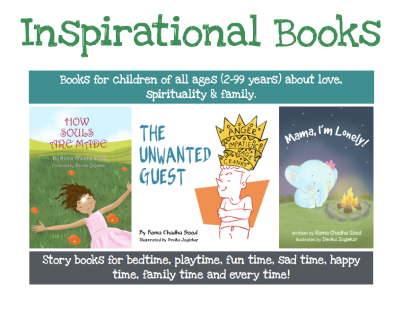 I totally recommend these books!" Fun and easy workbooks for after school activities at home! 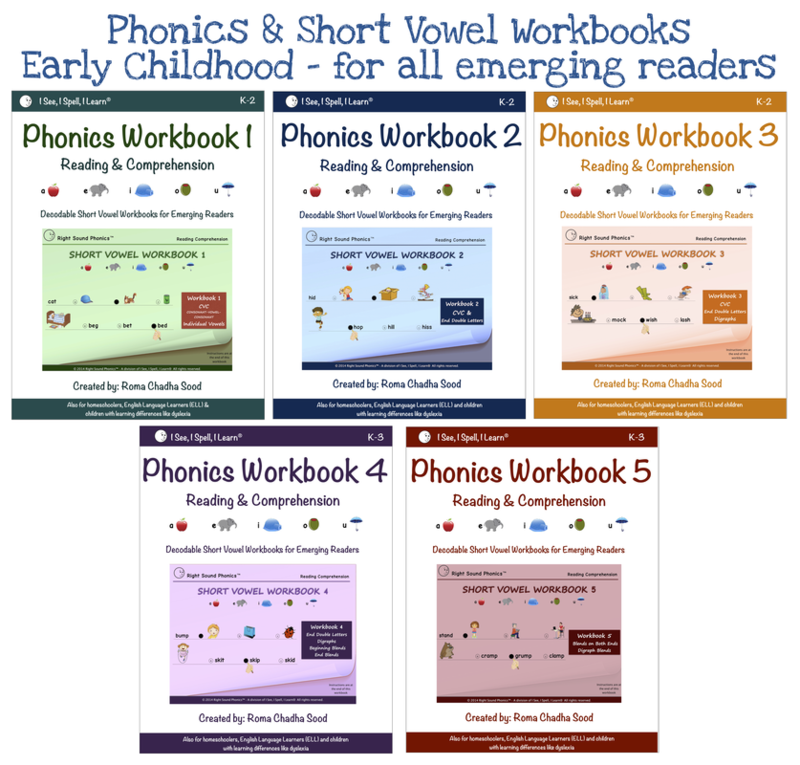 "Great workbooks for kids in kindergarten to 2nd grade to build reading words and comprehension. Lots of fun and will keep them busy after school. Wish there were more than just 5 of these!" "I started these workbooks with my twin six year olds. As part of their reading & spelling program, I used these workbooks, picture storybooks and picture sight words cards and boy! did my kids love it? They looked forward to doing these fun activities every day and learned along the way! I love these learning products and look forward to using their homophones and other products as my boys grow older." Children with learning differences like dyslexia, ADD/ADHD, autism, etc. A California-based company specializing in fun & innovative resources for reading and spelling. Our products have been inspired by children and created by teachers. Our widely used Reading & Spelling Program includes Picture Sight Words™, Picture Homophones™, Phonics Readers and Phonics Workbooks. Our team of experts - children, teachers, parents - are on a mission to create products that are easy and exciting to use across various platforms - the old-fashioned yet effective flashcards, workbooks, children's books; and the new world of digital channels like ebooks, interactive books & Apps for iPhones & iPads. 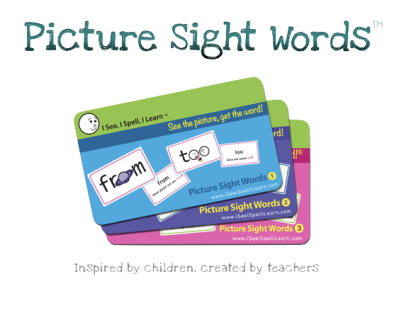 Picture Sight Words™ and Picture Homophones™ flashcards and workbooks, Phonics Workbooks, Phonics and Sight Words Storybooks are used in classrooms in private, Montessori, charter and public schools in the US, Canada, Europe, Australia & Asia. ​We have State Business Licenses in US states to sell to public, charter & private schools. We have special discounted rates for schools and bulk orders. We work through schools' purchase order systems and offer a 30-day payment timeline after delivery. I See, I Spell, I Learn® has been recommended for homeschoolers. One of the greatest advantages of these Picture Sight Words™ & Picture Homophones™ cards is that they can be used as a stand-alone program to teach how to read and spell sight words and homophones, but they can just as easily be incorporated into an existing reading program your child is using. 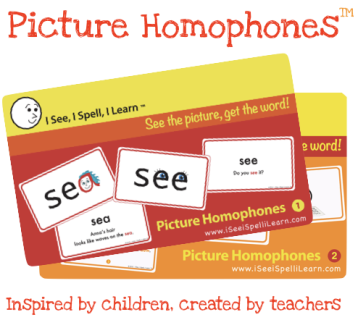 Picture Sight Words™ and Picture Homophones™ cards can be used along with any Orton-Gillingham-based program such as All About Reading, All About Spelling, Barton, Wilson, etc., or any other reading & spelling program. ​The repetition provided in structured programs is excellent for dyslexic and other right-brained children. But Picture Sight Words™ and Picture Homophones™ give the child tangible picture cues to hold on to in addition to just repetition, greatly reducing the time it takes to master spelling and reading of sight words and homophones. The picture cues embedded in the letter make all the difference. ... to creating educational materials to help emergent readers (K-5) develop reading, spelling and comprehension skills. These creative products help children learn faster and have more fun while learning. They also make excellent teaching tools for children with dyslexia and other learning differences. While I See, I Spell, I Learn® products can greatly help children with dyslexia, they are being used by parents and teachers in the U.S., Canada, U.K., western Europe, Australia and Japan to make learning fun for ANY child (K-5).